Idea generation from previous mini-golf hole. Our 3rd Annual Putt Putnam County mini-golf hole building tournament is underway and the holes this year looking better than ever. 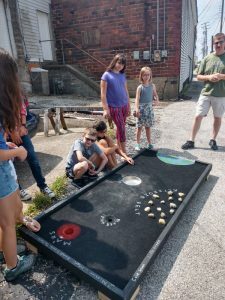 With about a dozen mini-golf holes that I’m aware of, there’s still time to put together a quick hole for a night of family fun. This year we’re holding the ‘putt off’ at the First Friday event in downtown Greencastle from 6-8 pm. Main Street Greencastle is helping us to arrange Franklin Street to be blocked off, so we’ll have the holes down the street as part of the First Friday event. And several community organizations are also building holes for the event. With entry holes from “Alice in Wonderland” to “Virtual Golf” it promises to be a fun, no charge event for the community. Come join us on October 5th!